Chopta is an untouched destination which lies in the lap of the Uttarakhand Himalayas and offers one undisputed views of the Himalayan ranges which include the peaks of Trishul, Nanda Devi and Chaukhamba. Located at an altitude of 8790 ft above sea level, the hamlet is wrapped by the forests of pine, deodar and rhododendron and is also home to a rich collection of flora and fauna. The valley is a one-stop destination for adventure lovers and trekking enthusiasts. Chopta is a small region formed of meadows and evergreen forests, which is part of the Kedarnath Wildlife Sanctuary and the base camp to Tungnath. Due to its high altitude, the place witnesses heavy snowfall and makes it impossible for visiting the place. Hence, the months from March to October are considered as the best months to visit the place. This is also the time when the shrine of Tungnath opens its doors to devotees. By Air: The nearest airport to Chopta is the Jolly Grant Airport which is located at a distance of 221 km from here. The airport is well connected to a number of airports across the country with regular flights operating from Delhi. By Train: The nearest railway station to Chopta is Rishikesh which is located at a distance of 202 km. The station is well connected to most of the major cities and towns across the country and the state of Uttarakhand. 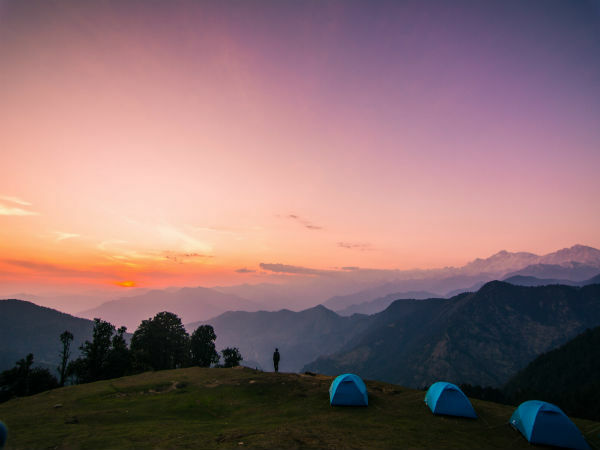 By Road: One of the best ways to reach the place is by road, Chopta is well connected by a excellent network of roads and has regular bus services from major towns and cities, such as Haridwar, Rishikesh. etc. The total driving distance from Delhi to Chopta is around 403 km and can reached by taking one of the below the mentioned routes. If you opt to travel by route 1, it would take you approximately 11 h to reach the place after covering a distance of 403 km. The route takes you through some of the well-known cities, such as Haridwar, Rishikesh, etc. If your choice is route 2, then it would take you around 11.5 h to reach the destination by covering a total distance of 409 km. Haridwar is one of the holiest cities in the country and to the followers of Hinduism. The place marks the point where the river Ganga flows down from the Himalayas and touches the plains before making her way to the Bay of Bengal. The place is home to a large number temples and other religious places apart from the numerous ghats, which would be filled with devotees who consider taking a dip in the holy river would wash away the sins committed and would free oneself from the cycle of rebirth after death. When here, make it a point to visit the shrines of Mansa Devi, Chandi Devi, Bharat Matha and many more of them. Another major attraction here is the evening Ganga Aarti which is a very unique sight which cannot be given a miss. The place offers some of the rare flora and fauna which attract rare Himalayan animal species and thus, wildlife enthusiasts. The place slopes on alpine and grassy meadows and is a fine example of natural beauty which offer breathtaking views of the multiple peaks of the Himalayan ranges. Chopta is truly a trekker's delight as well as an explorer's paradise, which gives you a life-changing experience and helps you expand the boundaries of your horizon. Considered to be as the highest temple dedicated to Lord Shiva, the shrine is located at an elevation of 3680 m above sea level and is one of the Panch Kedar shrines. The shrine remains closed during the winter months as the entire place is covered in snow and the idol is shifted to Ukhimath for the daily prayers. One can reach the shrine after a 4 km long steep trek beginning from Chopta, which is considered to be an extremely demanding and exhausting one, but thanks to the efforts of the government authorities, who have cleared up the path, the trek is made easier for beginners. Located on the Ukhimath-Gopeshwar road, the lake can be reached only after a 2 km trek which passes through the Sari village which is indeed an experience to cherish. Deoria Tal is a lake which is surrounded by pine forests and the peaks of Chaukhamba. According to Hindu mythology, the devas are said to have bathed here. Locals believe the lake was built by Bhima, the second Pandava, to quench his elder brother, Yudhishthira's thirst.